Discussion in 'Marketplace' started by billybu69, Apr 13, 2019. I am also on the lookout for a copy … queued for over 2 hours and still missed out - I hate Record Store Day! 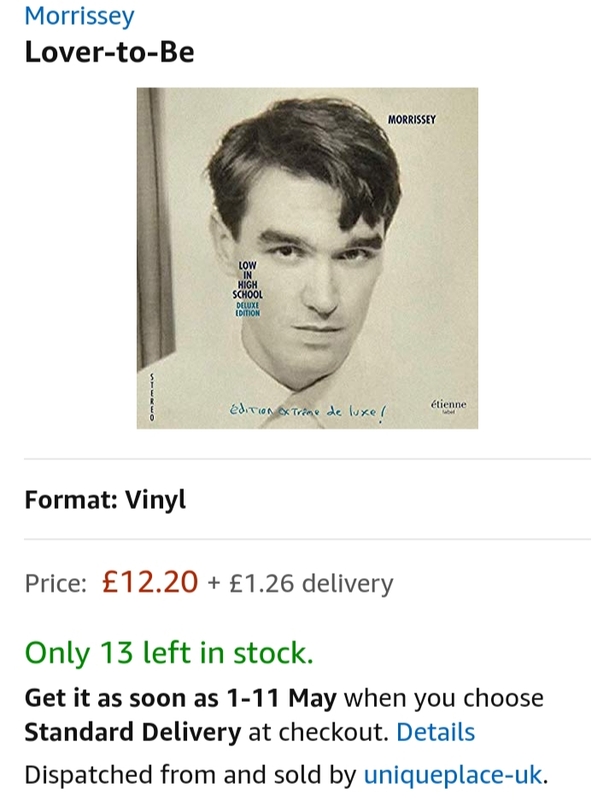 How much are people getting for these MOZ RSD vinyl? I couldn’t make it to the nearest record shop so lucky for me my friend had three with only two to spare. He sold one to me for $35.00 dollars. I know they were close to $20.00 dollars, but I was happy paying him $35.00 dollars without all the hassle of waiting in line for hours just to find out that the record shop has sold out of the MOZ RSD vinyl way in advance before I made it inside the record shop. I've just succumbed to ebay and paid £25, annoying they'll be cheaper I'm sure but I won't wait. Hardly an obscene amount. I see loads of people asking for this single on various fan pages, do they know discogs exists? It’s €20 on there, like seriously how little do people wanna pay. Just cough up the dough and buy it. Be thankful it ain’t fifty quid. Many fans don't know Discogs.When i say to buy on Discogs, to some of them,they said "what's that?". Yes ,before day 13 abril some paid 50 or more,and now 30 or less.So when day 20 arrive,we will see price decrease. No it's not , a crazy amount, but it's the principle annoys me, a Morrissey single release on any other day won't sell out still only 1500-2000 copies and everybody gets there order fulfilled, come record store day, it's a name all the flippers know so everybody gets it with their Dr Who, and Pixie the snow queen soundtracks, suddenly all the usual suspects who buy everything with Morrissey printed on the front, are paying 3 times what it should be. I couldn't wait and paid £23 on ebay on Sunday. I know it's not a lot of money but that's not the point. RSD is just a con. It is an easy way for a load of arseholes to make money out of genuine fans / collectors. I saw some copies for sale a few days before RSD - these can only be the actual record shop owners or employees. I asked the owner of a shop near me how many copies he had got on the day. He ordered 10 and only got 2! The whole point in record store day is to promote independent record shops - I'm all for that but I have still been ripped off and it pisses me off! An Amazon 'partner' is selling a few at a reasonable rate in the UK (97% seller rating). They haven't ramped the price up and some stores were selling it for close to that. (stock appears available on Amazon DE, FR & IT too). Ahh thanks for this though naturally I missed it. Queued for 3 hours last Saturday to get it but no joy. I thought I might be able to get it online this morning when all the record stores put their leftover stock online but no joy. I refuse on principal to pay upwards of £15 for a 7”, hopefully the eBay ones will come down in price in a few weeks.